Through her offering of Sacred Shapes, Omotayo Evans-Akingbola holds dance meditation workshops supported by the ancient ritual of the cacao ceremony. Cacao (the raw form of chocolate from the cacao fruit tree) has long been revered as a heart opening elixir, and was frequently used by the Aztecs and Mayans during their riutal celebrations. Working with this sacred medicine in her dance workshops, Omotayo share a more intuitive way of being that is guided by the heart. By encouraging us to move to our own rhythm, Omotayo's practice invites us to move beyond the constraints of the mind, and into the transformative power of meditation in motion. Here she offers insight into her daily practice of embodiment, and the importance of patience as we navigate the changes within our lives. It’s really important for me to begin my day with something that helps me to feel grounded in my body. Some days I have time for an hour of yoga and sometimes I can only do a few minutes of stretching or five minutes of silent dance meditation. Once I’ve completed this, I will always tkae a moment to sit and breathe infront of my altar. 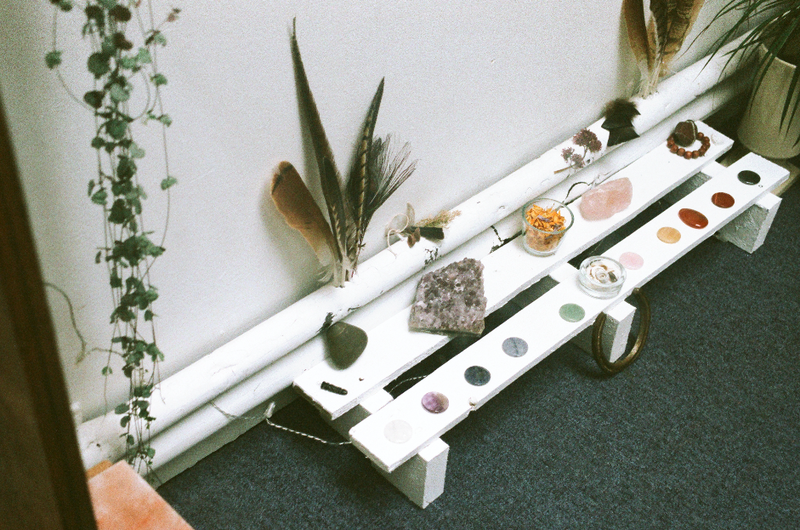 I see my altar as an outward expression of my heart space, so I try to give it a little bit of attention each day. I’m trying to get into the habit of not checking my phone until after my morning rituals, so that I give myself a little window which is carved out just for e to connect with myself, before heading out into the world. It’s so easy for us to just wake up, roll out of bed and straight out of the door, our minds already whizzing ahead thinking about all the things the day will bring, whilst our bodies might still be catching up. By starting my day with these embodiment practices, I’m bringing my awareness and attention to the task of aligning my mind and body. By the end of the practice I always feel energised and grounded. Setting an intention for the day is also a wonderful practice hat helps me to consciously focus the lens of my perception on what I want to call in that day. Sometimes it’s as simple as peace, presence and love, but it always gets my head in the right space. Especially if I know I’ve got a challenging day ahead of me. I feel like the process of life becomes one of continual transformation when we commit to living from our heart and becoming the most authentic version of ourselves. Transformation is usually preceded by some kind of awakening, sometimes when we least expect it and sometimes completely unwelcome because we’re quite safe and content in our comfort zone! But often the Universe has something up its sleeve to shake things up. It’s like we get a cosmic wakeup call that suddenly shows us with incredible clarity what we need to do if we want to move forward. These moments for me have been humbling, ecstatic, terrifying and affirmative all at once, simultaneously beautiful and painful. Beautiful because I’ve known in my heart that it’s for the highest good and that I’m growing as a result, but painful because there can be no development without dissolution of some kind. Dissolution can be difficult because often we feel like it’s part of ourselves that we have to let go of. Before the caterpillar becomes a butterfly , there is a period of metamorphosis where the caterpillar breaks down into a little primordial soup in its cocoon. It is from this state that the beautiful form of the butterfly emerges, kind of like a phoenix from the ashes. Existing in that soup in-etween one chapter and another can be incredibly challenging but one thing I’ve learned is not to hurry through this phase that can feel like being in limbo. I’ve learned that this phase is crucial for gaining clarity on what it is we’re ready to release and what kind of butterfly we are really ready to become. This phase teaches us to simultaneously chart our course and surrender to the flow. Transformation has taught me to trust the process of my own unfolding. It has taught me that no matter what, if I remain true to my heart then life is no longer a series of right and wrong choices, it becomes a tapestry of lessons and blessings. What I aim to offer through any of the work I do is to simply create a space in which a person can become more comfortable with expressing their authenticity, and to feel that this authenticity is not only witnessed but also celebrated and loved. A space in which they can feel safe to explore their own internal landscape without fear of what they might find there, a space to exhale and root a little deeper into their own being. When we dance, we’re not really ‘trying’ to change anything, we are surrendering to what is real for us right now. And in doing this, we often then experience a change that arises naturally without force or effort. Ultimately, all of my work aims to support people in becoming who they were born to be; the light and the shadow, the joy and the pain, no more and no less than a perfectly unique amalgamation of conscious cosmic stardust, here to love and be loved exactly as they are. Issue One is already sold out - but look out for future issues coming to The Basics Store in 2019.